Brooklyn Borough President Eric Adams: The world has become too tolerant of anti-Semitism. We must not tolerate it. 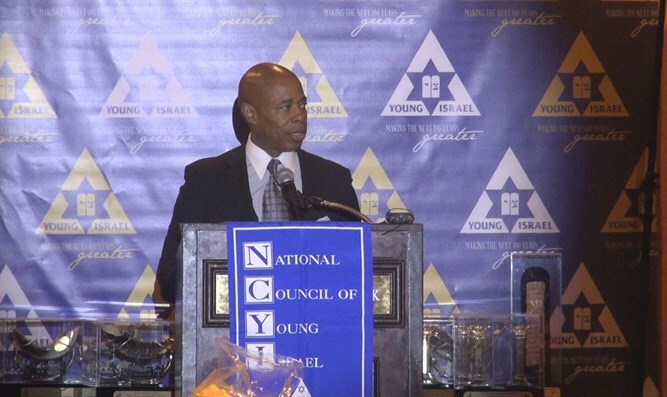 Brooklyn Borough President Eric Adams spoke on Thursday night at the National Council of Young Israel's annual gala dinner. In his remarks, Adams warned that “we are becoming more tolerant of anti-Semitism and hatred and racism” not just in the United States but across the globe. “We must have an internal thermostat that doesn’t tolerate one degree of change of any form at all,” he said. “I want to say to you, the Jewish community: I spent 22 years of my life in a bulletproof vest as a member of the New York City Police Department, protecting the children and families of this city. In Brooklyn, we have the largest Jewish community outside of Israel. As the Borough President of that Borough I can promise you and commit: It doesn’t matter if I wear a blue police uniform or a blue suit, I’m committed to ensuring that you, as I, can continue to raise healthy children and families,” continued Adams. “70 years of celebration of a great country in the midst of all of this despair have given us great hope, great aspirations and great views for the future. I thank you for what you have done, and the long partnership we have had with the African-American community and Israel and the Jewish community throughout the years, let’s continue to build on that and continue to grow together,” he concluded.